Russian scientists have identified the components of the oldest bitumen sample to be found in an ancient vase and made an accurate estimate of its age. In their article in the Journal of Mass Spectrometry, the researchers from the Moscow Institute of Physics and Technology (MIPT), the Skolkovo Institute of Science and Technology (Skoltech), the Institute for the History of Material Culture, the Talrose Institute for Energy Problems of Chemical Physics, and the Emanuel Institute of Biochemical Physics of the Russian Academy of Sciences (IBCP RAS) propose a new and more effective approach to organic compound analysis and introduce specially designed software. Bitumen is a form of petroleum found in natural deposits. Its use dates back to the Stone Age. The word ‘mummy’, for example, derives from the Persian ‘mūm’, or ‘bitumen’, because this substance was used in embalming. The Greeks used bitumen in construction, medicine, and warfare—it is possible that the legendary ‘Greek fire’ was based on bitumen. The oldest amphora filled with bitumen (5ᵗʰ century BCE) was discovered by Russian archaeologists on the Taman Peninsula, a highly volcanically active region (numerous petroleum seeps are located there) and a possible source of the bitumen imported by the Greeks. 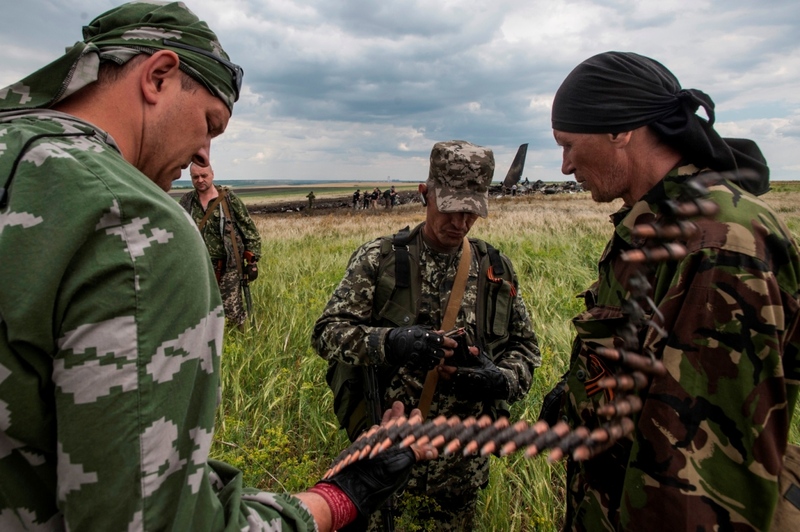 Russian-speaking combatants gather ammunition from the place of crash of a Ukrainian fighter aircraft. Many of us remember the classic book “Clash of Civilizations” (1996) of Samuel Huntington, the main successor to the geopolitical school of the British historian Arnold Toynbee, and his remarks on the bipartition of the cultural identity of Ukraine and Turkey, which is dramatically verified for both of them in the last twelve months. Yet Turkey, despite the dramatic events taking place in the country during the last year, does not wobble as much as Ukraine. Let’s see how things have developed for the Ukrainian crisis and then some scenarios on its solution. The terms of the recent agreement were not really implemented and the Ukraine is possibly moving towards a more violent confrontation. The “big players” (Russia, U.S., E.U. and China) are rather cautious preferring keep waiting, except the rapid Russian annexation of Crimea. The Western media have probably overstated the financial dependence of Russia from the Western economies, although the American financial reprisals on her have already been felt in the country. Neither Russia can seriously threaten the U.S. in retaliation, but can push to a certain extent the European Union using energy reprisals. Of course the latter did not have any serious problems of energy supply before the energy agreements with Russia, but it now appears to depend a lot on the inexhaustible Russian gas resources, especially Germany, France and the other Northern European nations. The Ukrainian crisis is the outcome of the constant attempts of the U.S. and the E.U. to penetrate a geopolitical region which Russia considers exclusively her own since at least 1793. However it seems that they have not anticipated the extent of the internal struggle in Ukraine. What are the reasons of the current embarrassment of the “major geopolitical players”? 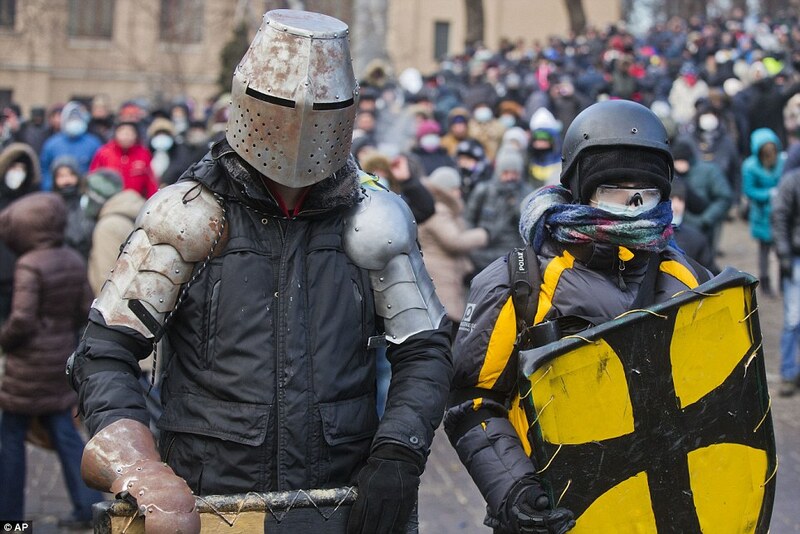 A typical image of the orientation of the Western Ukrainians to the West (EU and the USA): two Ukrainian protesters before Yanukovich’s expulsion, wearing helmet, armor and shields of Western Crusader types (rather of the Teutonic Knights). They obviously prefer this kind of arms and armor than the traditional Russian ones of Alexander Nevsky and Dmitry Donskoy (copyright: Associated Press). The country now called Ukraine consists of two main geophysical areas, inhabited almost always by different ethnic groups until around 1790, when the entire country became ethnically homogeneous, overwhelmingly inhabited by Slavs. Although the Crimea, since 1954 belongs to the Ukrainian SSR and then to the independent Ukraine, this large peninsula is a geographically and ethnologically independent area. But because Crimea is a part of the modern ‘problem’ of the Ukrainian division, I will additionally deal with her in this article. The two major geophysical regions of Ukraine is the southern steppe and the wooded or semi-wooded area of the North. Of course nowadays, both areas have been delivered largely on crops, thereby this distinction is now very relevant (almost non-existent), but this geophysical situation existed until the recent centuries. Since the Middle Ages, the wooded area of the North have been delivered largely on crops, while the South remained a steppe until the 18th cent. On the ethnological status of the Ukrainian lands in Antiquity, I have already written in my article ΤΗΕ BOSPORAN KINGDOM (CIMMERIAN BOSPORUS) – PART I and PART IIwhere although the main theme is the kdm of Cimmerian Bosporus, I refer also to this topic. In the 5th century AD, the steppe of the South was inhabited by Hunnish tribes while the northern woodland was inhabited by Slavs. The steppe was occupied by a succession of Altaic peoples (Avars, Proto-Bulgars, Khazars, Pechenegs, Cumans-Kipchaq-Polovtsy, Mongolo-Tatars, Tatars and others) until the 18th century. The same tribes controlled the neighboring Crimea except its southern coast which was controlled successively by the Byzantine Empire, Genoa and the Ottomans until 1783. Northern Ukraine together with the neighboring SE Poland, is the metropolis of all the Slavs, who extended their lands in all directions except the steppe, due to the presence of the dreaded nomads there (except some sporadic attempts like the ones of the Ulichi, the Tiverchi and the Kievan Rus). The Slavs were formed in this area during the first millennium BC, when they were detached ethnically from the Baltic Indoeuropean group, in which they originally belonged.